Have you ever opened your refrigerator door and stood in front of it dumbstruck, seeing plenty of food but not knowing what to eat? We've all been there, and know how awful it is. 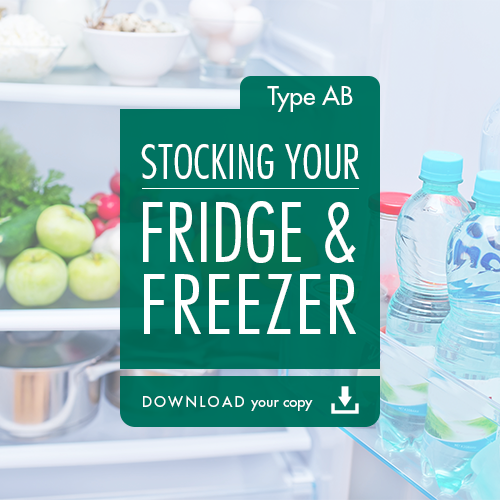 To help you solve this problem we are featuring a great “how-to” excerpt from the ER4YT Personalized Cookbook series entitled “Your Refrigerator and the Blood Type Diet.” This is a great resource about how to stock your fridge based on blood type. *Editors note: This is an excerpt from the Eat Right 4 Your Type Personalized Cookbook for Type O by Dr. Peter J. D’Adamo with Kristin O’Conner, copyright 2013. For other helpful tips and delicious recipes, check out the right blood type version for you in our Eat Right for Your Type Personalized Cookbook series.